When you're tired, in a hurry and don't want to spend a lot of money, coffee from a vending machine is appealing. With competition from coffee shops, many vending machines are offering both higher quality instant coffee and coffee made from fresh grounds. Coffee brewed from ground coffee beans contains 2 calories per 8 oz. serving. Instant coffee mixed with water has 4 calories. A tiny amount of oil and protein in coffee accounts for the calories, according to the Diet Blog. Plain, black coffee adds little to your daily calorie count, but when you add creamer or sugar to your cup, you add significant calories. Non-dairy creamer contains 33 calories per teaspoon and sugar contains 48 calories per teaspoon. 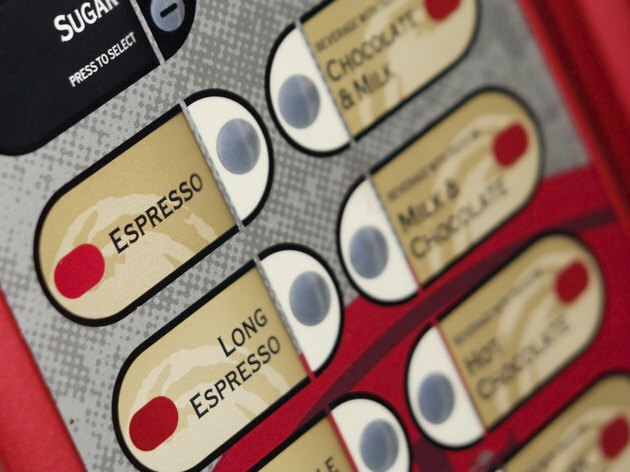 Vending machines give you the option to order coffee with or without additions. Vending machines that use instant coffee automatically mix the crystals and hot water and dispense the brew into a cup. Machines that offer coffee from fresh grounds use a high-speed brewing process that forces hot water through the grounds with air pressure before dispensing. Diet Blog: How Many Calories in Coffee? The Kitchn: Food Science: How is Instant Coffee Made?